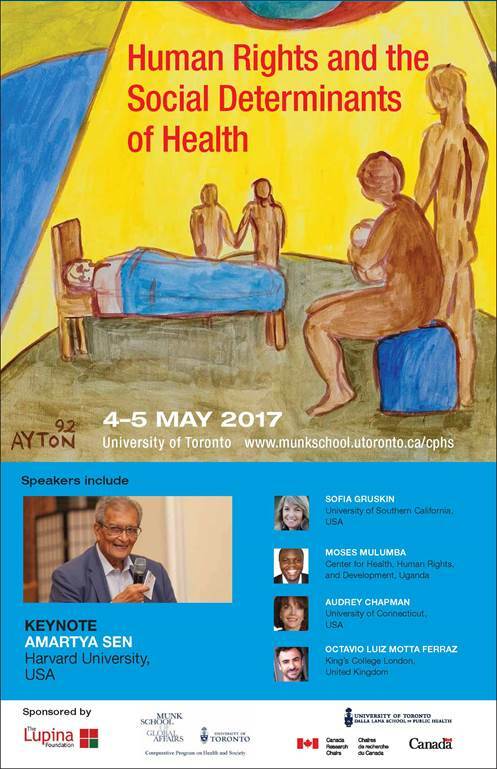 for the poster for their Symposium, "Human Rights and the Social Determinants of Health". In May 2015 the Brazilian Ministry of Education will launch the online specialization course on Education, Poverty and Social Inequality. The course will be offered to teachers, school administration staff, secretaries of education and other professionals whose work is related to education and public social policies all around Brazil. The main purpose of the course is to provide them with discussions and tools to deal with a relatively new phenomenon in Brazilian education – the universalization of access to basic education in the country. Today, around 97% of people from 6 to 17 years old attend school. From them, 17,476,882 children and youngsters come from families whose income is below the poverty line. Most of them rely on Bolsa Família, one of the largest and most successful social security policies for poor families – either if their members are employed in informal jobs, or completely unemployed. The program requires the family to keep their children studying in order to obtain government support. What questions do those students bring to educational practices and policies? That is what the course puts forward. The course’s study material, to be accessed online, is being produced by the Educational Technology Laboratory (NUTE) of the Federal University of Santa Catarina, which relies on the production of base-texts from different authors of Brazilian universities. 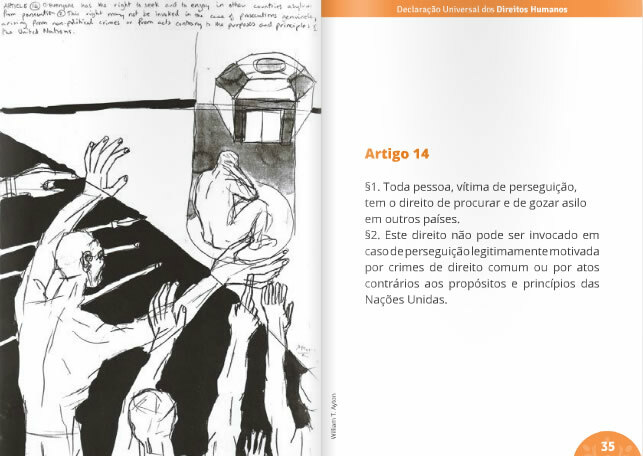 One of the course’s study materials, concerning poverty, education and human rights, written by Professor Erasto Fortes Mendonça from the University of Brasilia, features the work of the British-American artist William T. Ayton, who generously ceded a series of his drawings based on the Universal Declaration of Human Rights to illustrate one of the educational resources developed by the editing team. Access the resource, a pdf with the Declaration in Portuguese, with William’s drawings, is here. We, from the editing team of the Education Technology Laboratory of the Federal University of Santa Catarina are very thankful to the helpful collaboration of the artist, whose great work surely will contribute to the study of thousands of Brazilian educators. 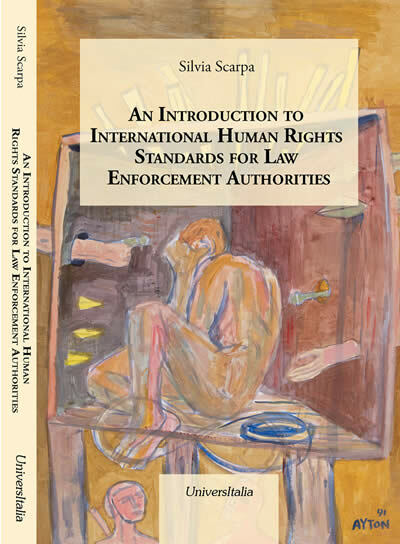 The 1991 painting of Article 5 (against torture and cruel and inhuman punishment) is featured on the cover of this new book by Silvia Scarpa, an Italian professor. She teaches Human Rights, Contemporary Slavery and Human Trafficking, International Law, and International Migration at John Cabot University in Rome, Italy. She is also the author of the book, Trafficking in Human Beings: Modern Slavery (Oxford University Press, 2008). Please click here to see the complete cover. The web page where the book can be purchased is here. The digital version (see news item below) of the Ayton UDHR art series is available for both public and private events around the globe. The photos on the left are from an event that took place in Lund, Sweden in early 2011. They demonstrate how the UDHR slideshow can be used in an educational setting, in this case for a meeting of around 30 university students. 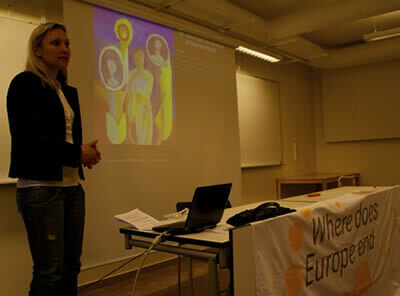 The event was organized within the framework of the "Where Does Europe End? *" Project of AEGEE (European Students' Forum, youth NGO) on the topic of human rights. Please contact info@ayton.net for more info about the UDHR Powerpoint slideshow. Thanks to Hatem Efe for sending us the photos. The 'Where Does Europe End' project functions within the framework of AEGEE (European Students' Forum), a student organisation that promotes co-operation, communication and integration among young people in Europe. As a non-governmental, politically independent and non-profit organisation. AEGEE is open to students and young professionals from all faculties and disciplines - today it counts 15.000 members, active in more that 240 university cities in 43 European countries, making it the biggest interdisciplinary student association in Europe. Where does Europe End project is concerned with European identity and the future of European integration. For this purpose, this project is conceived as a series of conventions, each with a different thematic focus, covering different countries of Europe. UDHR Slideshow, Article 1 (Powerpoint format) UDHR at the U.N.
William T. Ayton honored at the U.N. for the 60th anniversary of the UDHR. 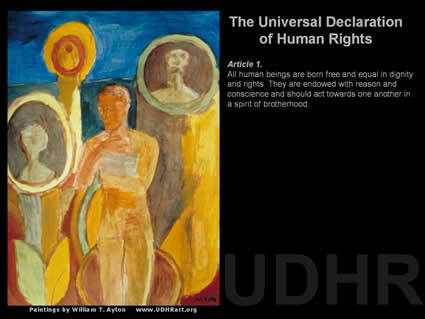 A digital version of the UDHR art exhibit was shown at the ECOSOC Chamber of the United Nations in New York on Dec 10, 2008. The digital exhibit premiered on Nov 5, 2008, at the BSR Conference in New York City attended by approximately 1200 people from 50 countries. The exhibit consists of the painted UDHR images & the text of each Article (does not include the Preamble.) We can make this digital slideshow (.ppt file) available to both non-profits & for-profit events, etc. Please contact info@ayton.net for more info. The 2-minute (approx.) 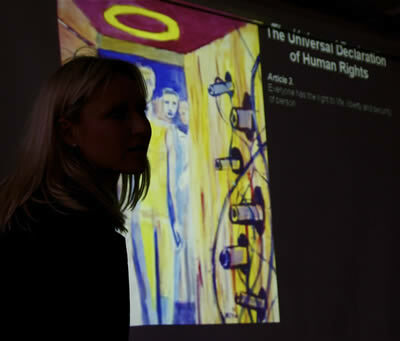 video to the right was put together recently using the images from the UDHR Spanish painted series. The 2-minute (approx.) video to the left was put together using the images from the UDHR painted series, & gives an overview of how the pieces develop sequentially. There is no soundtrack to this video at this time. The new small painting (right), done in February 2008, is the first of a possible series of human-rights related pieces that Ayton has done since the early 90's. Considering that 2008 is the 60th Anniversary of the UDHR, the artist felt it would be appropriate to re-examine some of the symbols & images from the original works. The piece is entitled "The Vessel", the name coined by Jeanne C. Findlay for the central symbol in many of the paintings, which morphs & reappears throughout the artworks. 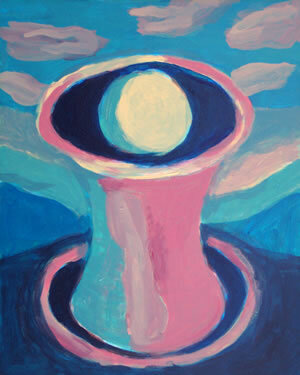 "The Vessel", acrylic on board, 10" x 8", 2008. Another new small painting, from the same series as above. This is a variation on the symbol in Article 18 (the right to freedom of thought, conscience & religion). 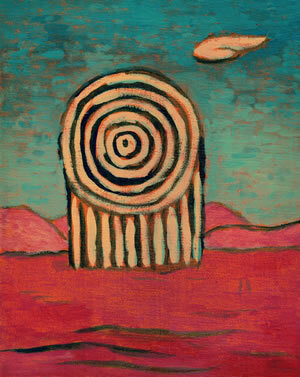 "The Vessel II ", acrylic on board, 10" x 8", 2008. 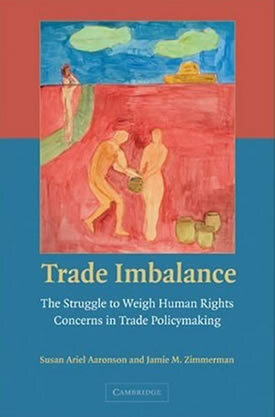 The painting for UDHR Article 23 (the right to work) was reproduced on the cover of "Trade Imbalance" (Cambridge University Press) by Susan Ariel Aaronson & Jamie M. Zimmerman in October 2007. The book had its own web site (no longer active), & several events surrounding the book were held in various institutions (Penn State University, Boston College, Harvard, etc).